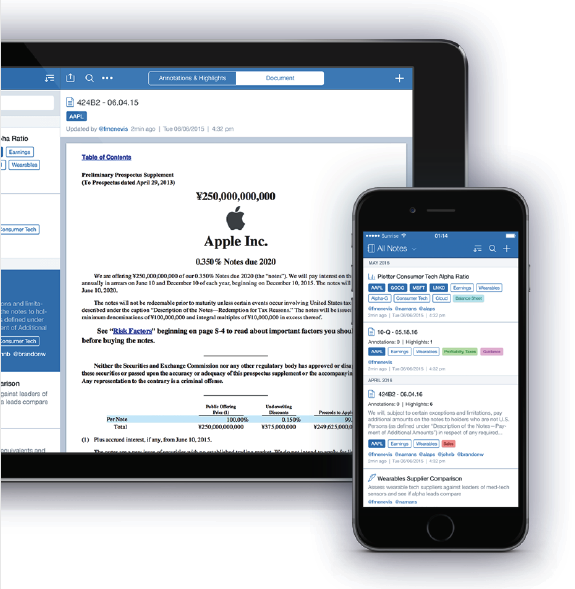 seamless integration into notes, and much more. 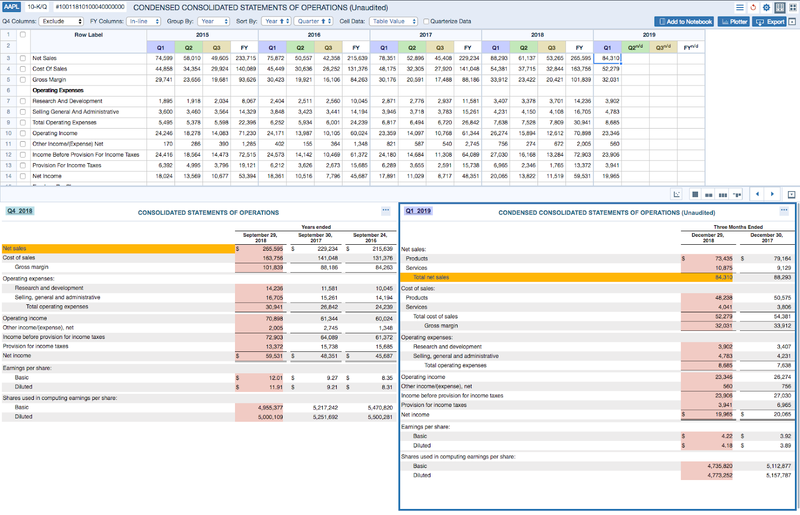 The newly released Relevance scoring algorithm, custom-built by our global team of data scientists, will surface documents most likely to be relevant to your search based on multiple factors derived from the statistical properties of the documents and the queries. For example, some of the factors considered are density within the document (inclusive of synonym matches), clustering, and recency. 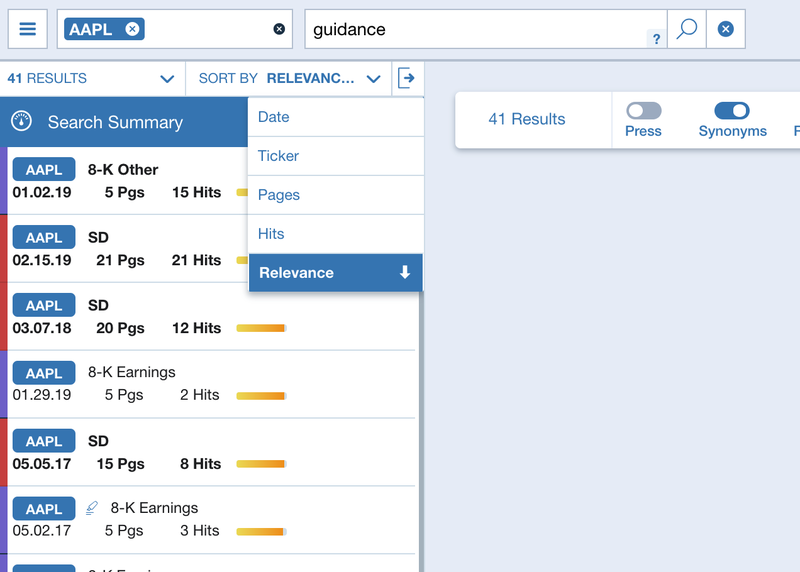 Relevance scoring is based on true machine learning and will only improve as Sentieo DocSearch “learns” over time. 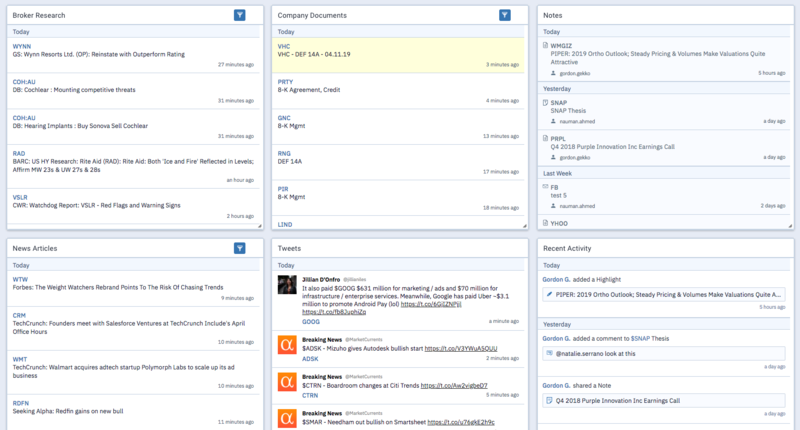 It gives you, the user, more time to focus on analysis where you add value, rather than on tedious searches. But we didn’t stop there. Another new sorting option is Sorting by Hits — because we know that sometimes you need the most recent documents at the top, sometimes you need the document with the most hits (mentions), and sometimes you need the one that is the most relevant. You can now toggle between these sorting options in one click, which allows you to compare the results before you dive in. 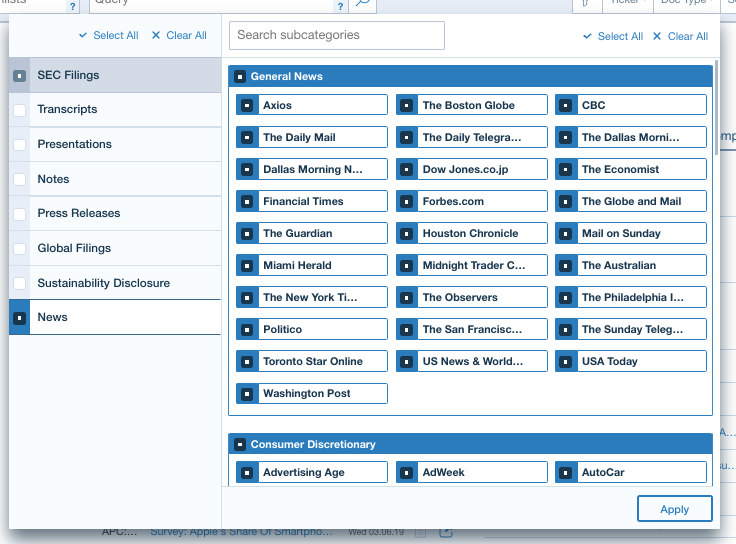 You can also sort by document size and by ticker for your multi/all ticker searches. You are in control of the format that fits your needs. 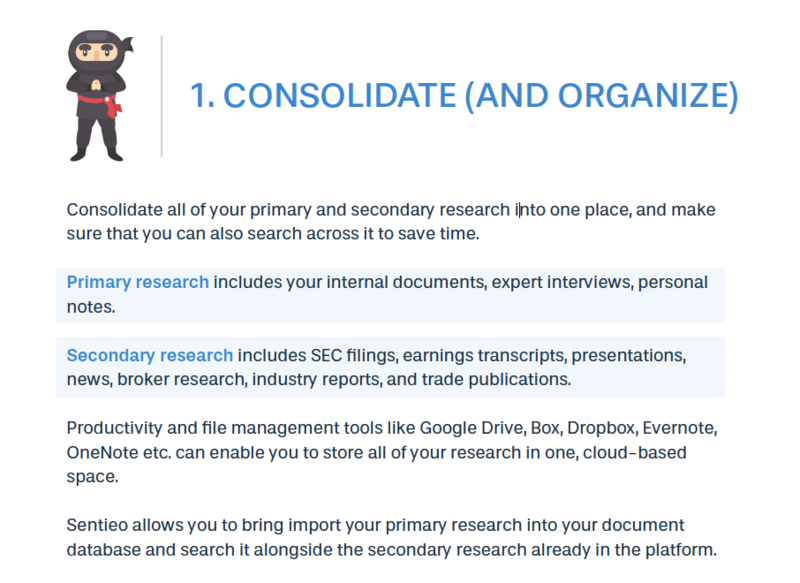 Users will find relevance searches suitable for broad initial overviews of topics: your search might pick up sector primer reports from the sell side, or a very topical deck from a corporate. Users more familiar with a topic might still prefer the reverse-chronological order of documents for the latest on the topic. 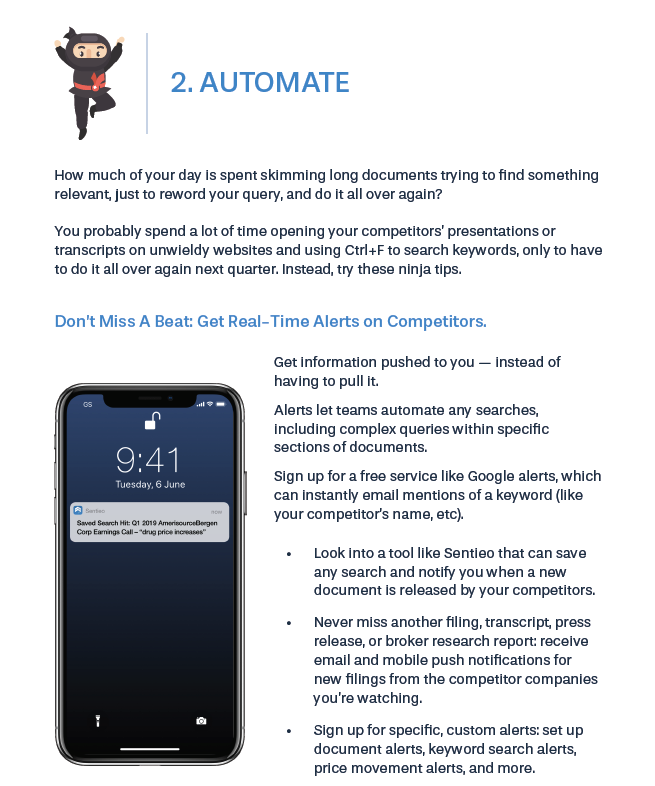 And, for people getting specifically into details, we have the specialized searches, such as in-transcript, said-by-the-CEO, or in-table searches that let you find the numbers around your topic within seconds. And there is still a lot more to come. 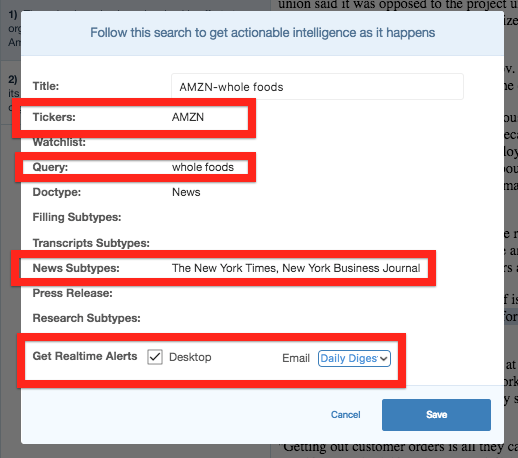 The 2019 Document Search product pipeline is better than ever, and you will see additional applications of AI/ML coming soon! When economists talk about inflation, they may describe themselves as “hawkish,” – in favor of policies which combat inflation – or “dovish,” that is, less concerned about inflation pressures in the economy. This nomenclature has migrated into the often jingoistic discussions around US Central Bank interest rate policy. In this world, “hawkish” refers to the Federal Reserve’s inclination to raise the overnight borrowing rate, and “dovish” conversely reflects a tendency to lower rates or leave rates unchanged. The Federal Reserve sets monetary policy via the Federal Funds Rate, which is the rate of interbank lending of excess reserves. This interbank lending rate passes into the economy through Fed member banks who pass the higher input cost of money on to their customers in turn. In effect, the Federal Reserve controls the price of money in the US economy. Therefore, figuring out which way the Fed is leaning in terms of “hawkishness” or “dovishness” is of great interest to money market participants. One of our core competencies here at Sentieo is Natural Language Processing. What NLP allows us to do is build predictive models from various sets of document data. We might be working with SEC documents for a specific company to extract company-specific key performance indicators, we might be chaining financial tables together over time for spreadsheet models, we might train models to extract guidance statements from company press releases, or classify research reports by type. In all cases, we’re using machine learning and deep learning for predictive analytics on a “corpus” of documents. As an exercise, we took a similar approach to Federal Reserve Meeting Minutes and then applied what we learned from this modeling to Fed Statements. As background, the Statements come out coincidentally with the Fed’s market action, usually around 2:15 on the afternoon of the last day of the meeting. The Minutes are then published a couple of weeks later. Market participants have very little time (because the market is open when the Fed releases its Statement) and very little data to work with from an empirical perspective (because the Statements are a lot shorter and less descriptive than the Minutes) when the Statements come out. For these reasons, parsing Fed Statements has become an industry unto itself. We scraped the documents in two sets: the Meeting Minutes and Meeting Statements. 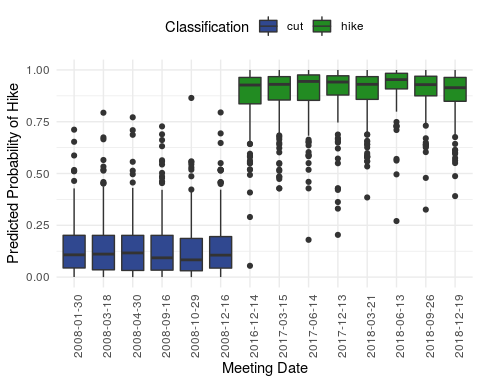 We used the Meeting Minutes to train a machine learning classification model for Meetings where the Fed raised rates and where they lowered rates. We used the classifiers from that model to then create a “FedSpeak” lexicon which we applied to the Meeting Statements in an effort to measure the relative “hawkishness” of the Statements dataset over time. We used this mixed approach (machine learning and lexicon) to facilitate sense-making over the multi-year interregnum period when the Fed left rates at zero. We trained our model on the Meeting Minutes because these are longer files with more data about the FOMC deliberations. We assembled the Minutes into a dataframe arranged by date, and further split the data into sentences and then filtered the dataframe to remove non-meeting-related text (description of open market operations, list of attendees, etc.). Prior to modeling, we took a look at the data by simple word frequency. 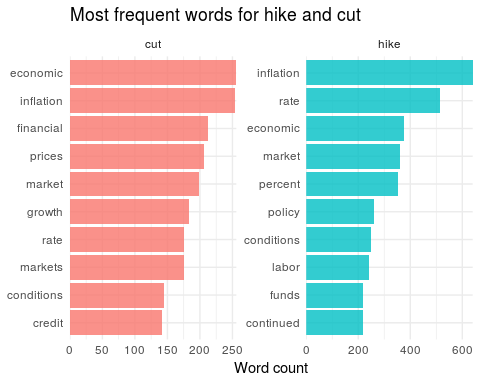 For visualization purposes, we classified each meeting as a “hike” or a “cut” meeting, and then arranged the most common words in each type of meeting. After performing this tokenizing step (with tokenizing meaning splitting the text into individual words) and then additionally creating a sparse matrix for use in our machine learning model, we had 3,412 observations and 3,347 features in the Fed Minutes matrix ready for processing. We then joined our “hike” or “cut” classification variable to the Fed Minutes to act as the response variable for prediction. In effect, we sought to determine the “hike” probability based on two classes of Fed Minutes: those where the Fed raised rates and those where the Fed lowered rates. Given our final matrix of input data, we then trained our classification model using the R package “glmnet” to fit a logistic regression model with LASSO regularization. 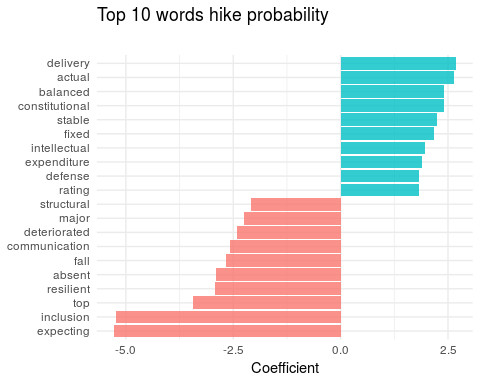 Importantly, the variable selection that LASSO regularization performs allowed us to determine which words were most important for prediction. As an example, we show the top 10 hawkish and dovish words in the model. As a way of visualizing how our predictive model performed, we’ve included a chart showing prediction results: the % probability of “hike” for each of the Fed Minutes we used in our classification model. The forest green box plots are Fed Minutes where the Fed raised rates. The blue box plots are Minutes where the Fed lowered rates. As expected, in cases where the Fed raised rates, our model predicted the same, and in cases where the Fed lowered rates, the probability of “hike” is very low. The black dots are outliers. The size of the boxes gives a sense of their variance. The bottom of the box is the lower quartile of the data, the top of the box is the upper quartile, and the line inside the box is the median of the dataset. Lastly, we turned away from the Fed Minutes, and loaded our dataframe of the history of the Fed’s Statements from 2008 onwards. Candidly, we like the Lexicon approach to Statements because it is fast, simple, easy to explain, and easy to visualize. We could have directly applied the trained Minutes model on the Statements and we do intend to explore this option more fully in future work. 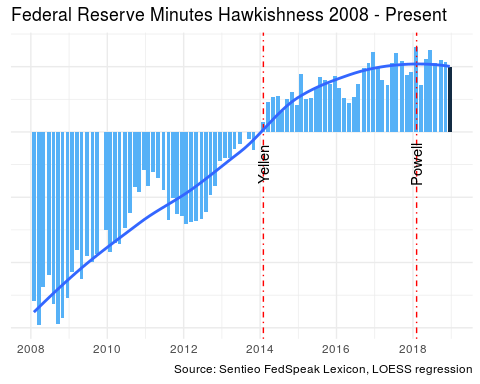 Having said this, the Lexicon approach shows the Fed has clearly transitioned from “dovish” in the 2008 period to “hawkish” in 2018, with a downtick in “hawkishness” in the most recent meeting. We believe that most market participants would agree the Fed took a less aggressive position vis a vis rates into year end 2018. The “dot plot” or forward rate curve has declined significantly since June of last year. For reference, we’ve added a LOESS regression line as a sort of smoothed rolling average to offer a sense of trend over time. Check out the following video interview below, which features Sentieo’s Senior Data Scientist, Jed Gore, discussing these findings. For more information and a free trial of our research platform software, please sign up here. After a tumultuous end to 2018, many Sentieo clients and friends have asked us for a shopping list of attractive stocks for 2019. As the only financial data platform that combines traditional financial data with alternative data, Sentieo is uniquely positioned to identify stocks that had positive Q4 topline performances which should translate into stock upside in 2019. 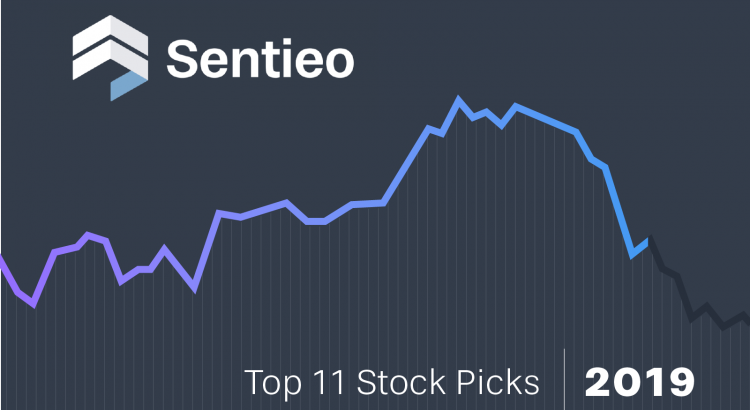 We’ll cover the 3 picks below in this blog post, but download the full report to see all 11 of Sentieo’s Stock Picks. Our Methodology: Why Does Alternative Data Predict Future Results? Alternative datasets are a powerful new tool in an investor’s toolkit. Focusing on digital ‘breadcrumbs’ left by consumers as they browse the web, search for products and websites and discuss products on social media, we are given a bird’s eye view of weekly demand trends for various consumer and tech businesses. Last year, the team accurately predicted the Netflix, Snapchat, Twitter, Skechers, and GrubHub beats using Sentieo’s Mosaic Index. For our 2019 Picks, we use Sentieo’s Mosaic Index as the key initial screen and then pair it with our team’s 60 years of qualitative buyside stock picking experience. On the qualitative side, we don’t hew to a single investment style or approach, but we focus on revenue growth as the most important long-term driver of returns. This approach naturally yields a growth and momentum bias to our portfolio, which we are comfortable with but seek to partially offset by focusing on businesses that are cheap relative to their growth rates. Our picks sport a median forward P/E of 33x and a median PEG ratio of 1.2. We are also heavily focused on earnings momentum for these businesses to prove out their market leadership positions and justify their valuations. We achieve this through a combination of classic earnings revisions models and our proprietary Sentieo Mosaic Index. We believe each stock on our list is poised to generate great absolute and relative returns in 2019. 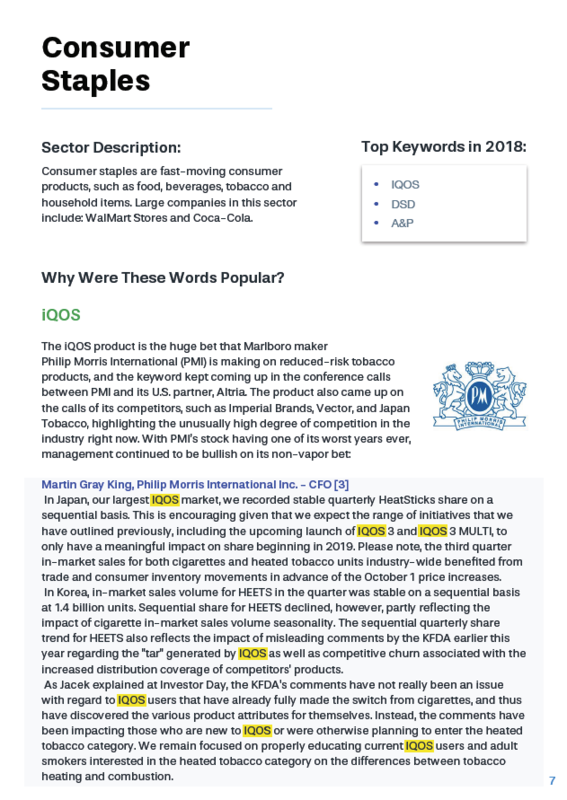 Since most of our team’s background is in the consumer and technology sectors and our Sentieo Mosaic Index is focused on these sectors, we have mainly focused our picks on these two sectors. This list is also primarily U.S. focused. However, we will be releasing broader lists as Sentieo evolves throughout 2019. 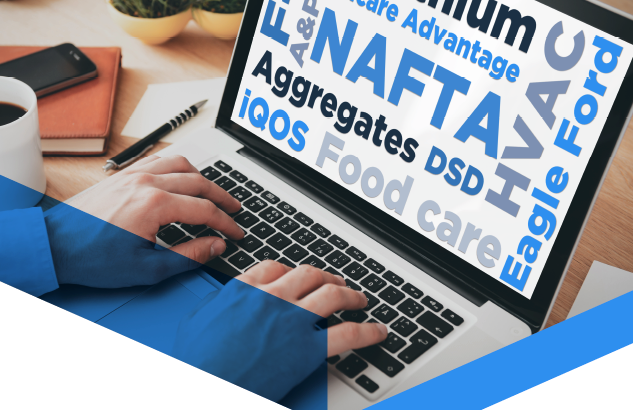 The alternative datasets offered in the Sentieo platform can provide an edge in analyzing consumer and tech businesses, as they often have a high correlation with revenue growth and are available ahead of traditional financial metrics for the period. As consumer behavior shifts more and more towards digital, indicators like these datasets have become more predictive of tech and consumer company results. To see all 11 of our top stock picks for 2019, please download our free report here. Lululemon essentially created the category of yogawear, and has leveraged this position to become a leading player in the growing casualwear revolution. As the world sheds suits and ties for more comfortable clothing, LULU is a prime beneficiary. As more folks understand the health risks of the modern sedentary lifestyle, they are seeking ways to be more active. LULU is also a leader in technology forward clothing, deploying its years of R&D and millions of pairs of yoga pants shipped to push the envelope on new synthetic fabrics that provide moisture wicking, odor mitigation and better fit in its products. Despite these powerful megatrends, LULU struggled from 2012-2017, with revenue doubling but EBITDA growing only 33% over the same period. After 15 years of rapid growth, it entered 2012 in a position where it was over-earning and could not keep growing sales at the same margins without serious delivery, quality and brand issues. After spending five years addressing these issues, LULU returned to margin accretive accelerating growth in 2018 and the stock responded, up nearly 100% at peak. Despite a stellar Q3 print, the stock is now down 25% from peak through a combination of disappointing guidance and a brutal tape for momentum and growth stocks. We believe that management was very conservative with their Q4 guidance, especially given the market volatility. However, we believe that the business momentum remains intact. Overall, U.S. holiday retail sales were very healthy this year, with Mastercard Advisors reporting 5% total growth. Sentieo’s Mosaic Index data suggests this upside was magnified in LULU’s results. Management stated that same store sales were running above guidance when they reported in December and we believe comps accelerated throughout the holiday season. LULU will attend the ICR conference in mid-January and we expect a strong holiday report ahead of the conference. In the chart below, we compare LULU’s same store sales growth year-over-year (black line) against the Sentieo Mosaic Index’s prediction for same store sales growth (blue line). This prediction, which is created from a regression against alternative datasets, should be used as a directional indicator. Since we are dealing with (1) a small number of quarterly points in our regressions and (2) underlying datasets that can be volatile, we recommend that investors focus less on the magnitude of each point and more on the directional changes. 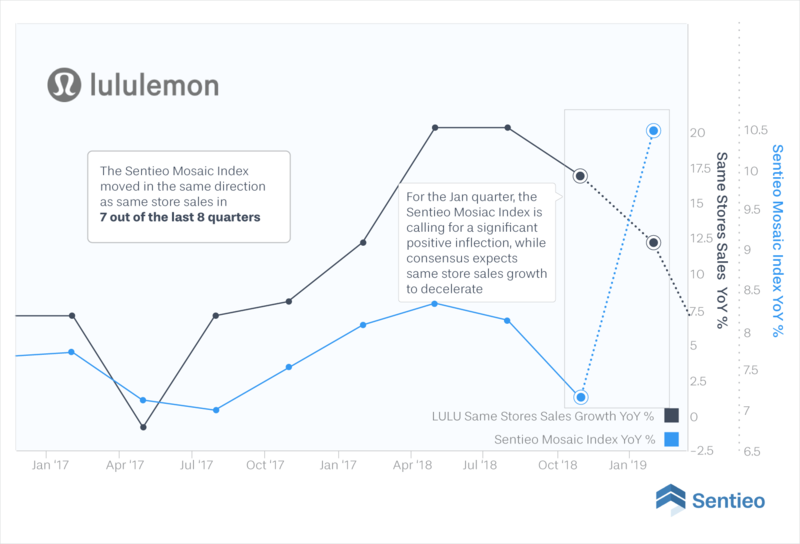 For example, the LULU Sentieo Mosaic Index moved in the same direction as same store sales in 7 of the last 8 quarters. Consensus same store sales estimates (dotted portion of the black line) are calling for a deceleration in the Jan quarter. 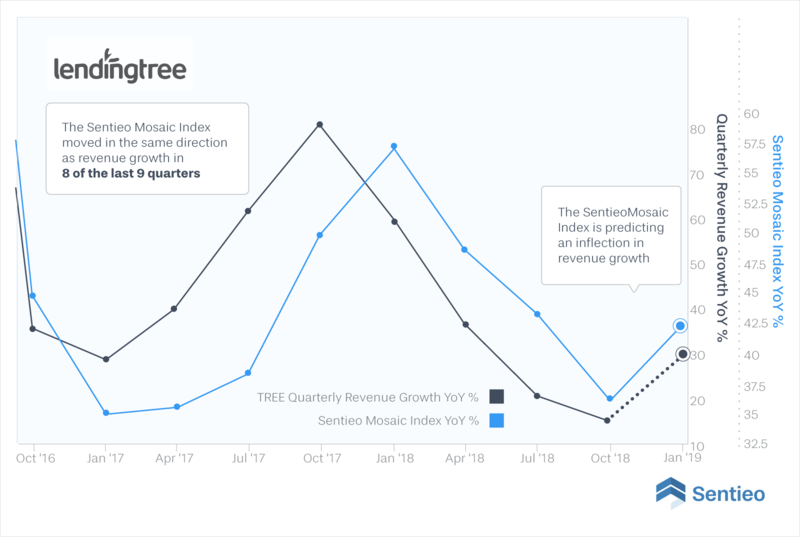 The Sentieo Mosaic Index is calling for a major positive inflection, however, indicating a potential positive surprise. LULU has many levers to continue fueling its current sales momentum. 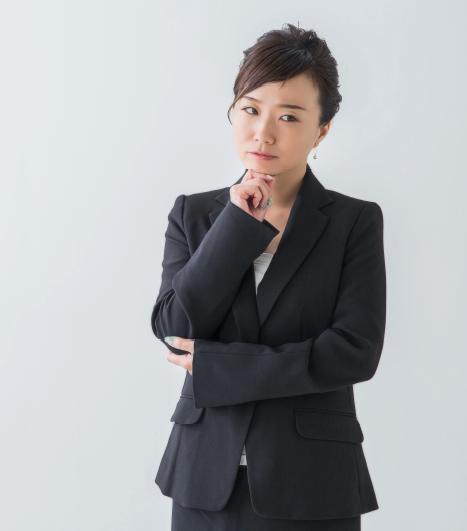 The business has typically been female-driven; however, the men’s business is just hitting its stride and is currently growing 100% year over year. The female/male mix is 78/22 today but there is no reason to think this can’t get to a 65/35 split in the coming years, especially as it continues taking share from male-focused peers like NKE and UA. LULU has the potential to double its store base in North America, which comprises 88% of sales today. 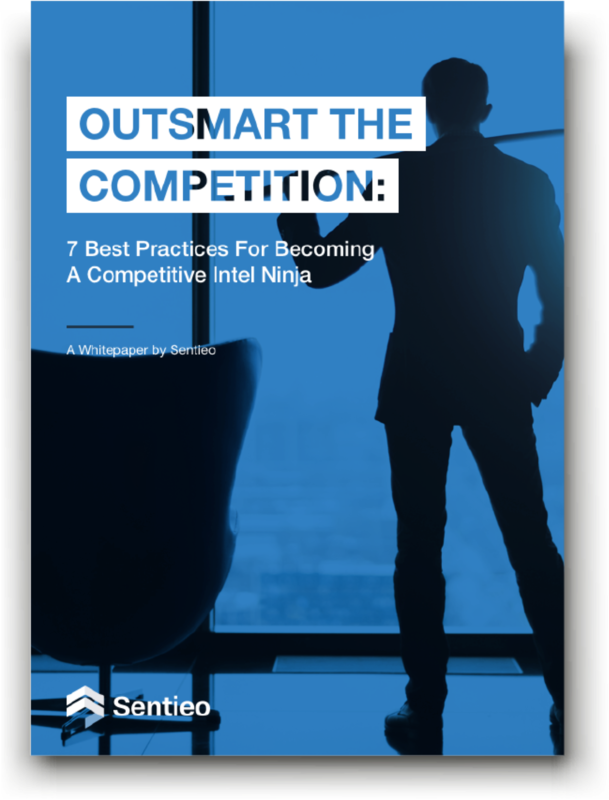 Equally compelling, over the next decade it should be able to replicate its North American playbook in Europe and Asia, providing massive open-ended growth. In 10 years, it’s not unreasonable to think that its geographic mix will be 50/50 North America/Rest of World (ROW), compared to 35/65 for NKE today. For this open-ended growth, LULU is a very cheap stock, at only 27x 2019 consensus numbers that we think are much too low. On an absolute basis LULU’s $18B market cap is modest compared to NKE at $118B and ADDY at $43B. Nintendo creates video game hardware and software. NTDOY’s newest gaming console, The Switch, appears to be a growing success that the market has not yet discounted. The Switch was released in March 2017 and was sold out for holiday 2017. Inventory finally reached in stock positions this summer and sales have slightly disappointed in the last couple quarters, which are seasonally less important. These small sales disappointments together with the Q4 market pullback has taken NTDOY from a spring peak of $55 to $35 today. Nintendo’s most popular game franchise is Super Smash Bros, and the Switch version was just released in early December. 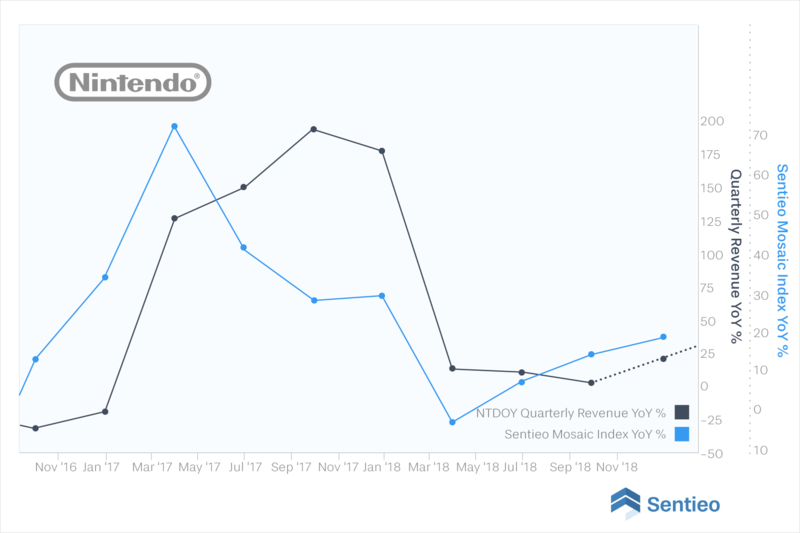 Our Sentieo Mosaic Index data suggests that this release, timed perfectly for the holiday season, appears to be driving a huge uptick in Switch sales, inline with Street estimates. Furthermore, using Japan as a leading indicator for the rest of the word suggests significant additional demand upside in the rest of the world in 2019. While the graph below doesn’t suggest a large Q4 beat such as most other graphs in this piece, we believe in-line numbers are enough for a significant stock move, as the buyside expectations are below consensus numbers. While the Switch is the key driver of near term earnings upside, there is much more to be excited about. Nintendo is a leading Japanese company and tends to be conservative in its speed and approach compared to western peers. This means that it has only just released micropayments for its online game worlds over the past year, whereas western peers like ATVI, EA and TTWO have done so nearly a decade ago, with this business generating ~50% of bookings, according to analyst estimates. Furthermore, NTDOY has a stable of classic characters with deep audience affinity such as Mario, Luigi, Yoshi, Donkey Kong, and Pokémon* that are finally being leveraged for movie and TV content. In this sense NTDOY reminds us a lot of Marvel Studios right before it was bought for a song by DIS, leading to the ubiquitous Marvel Superhero content today. Finally, NTDOY is in a privileged position for the coming Augmented Reality / Virtual Reality (AR/VR) wave. NTDOY owns ~20% of Niantic Studios that touched off the Pokémon Go craze in 2016 that doubled NTDOY’s stock price. A deeper slate of AR/VR content releases from both NTDOY and Niantic are expected over the next 18 months, and The Switch also has meaningful AR capabilities that NTDOY has teased with its recent Switch Labo release. NTDOY offers all this upside at very reasonable price. At 14x Calendar 2019 EPS, it trades at a 25% multiple discount to peers like ATVI and EA despite better revenue growth. It also sports an eye watering 3.7% dividend yield and at a $17B EV it is also relatively small compared to peers and the valuation it will be able to grow into over the next few years. LendingTree is a lead generation business that matches consumers looking for financial products with financial providers. TREE built its business on connecting homebuyers with mortgage lenders, and has used this market share and know how to steadily expand and acquire into new financial service verticals, including student loans, credit cards, auto loans, small business loans and personal loans. As the market leader for financial leadgen, TREE has been a huge beneficiary of customers switching to the online channel to comparison shop for financial products. This has propelled the stock from $4 a decade ago to $250 today. TREE’s average P/E multiple has been 50x over the past three years, as annual revenue growth has averaged 55% over the past three years. However, TREE’s stock suffered in 2018 as mortgage rates began to climb and the mortgage origination market slowed substantially for the first time in this cycle. With its high multiple, the stock suffered disproportionately, falling from a high of $400 in spring to a low of $200 in the fall despite only one quarterly miss and annual sales and estimates that have continued to rise. We believe TREE is well positioned to rebound in 2019. As the fed has turned dovish over the past month and global growth and inflation prints have come in below expectations, treasury yields have retraced much of their 2018 surge. Mortgage rates are now coming down accordingly, with rates flat YoY for the spring selling season for homes. In addition to improvements in the mortgage market, TREE has successfully diversified its business model. In Q3 mortgage revenues comprised only 28% of total revenues, down from 89% in 2013. In addition, TREE announced the acquisition of QuoteWizard in November, giving it a beachhead into the high growth insurance lead-gen market and dropping its mortgage concentration to 22% of total revenues. Our Sentieo Mosaic Index data is also highly supportive of a rebound. The strong Q4 trend inflection after a year of declines gives us great confidence in our thesis. At only 32x forward EPS, TREE is trading close to its cheapest level in years. 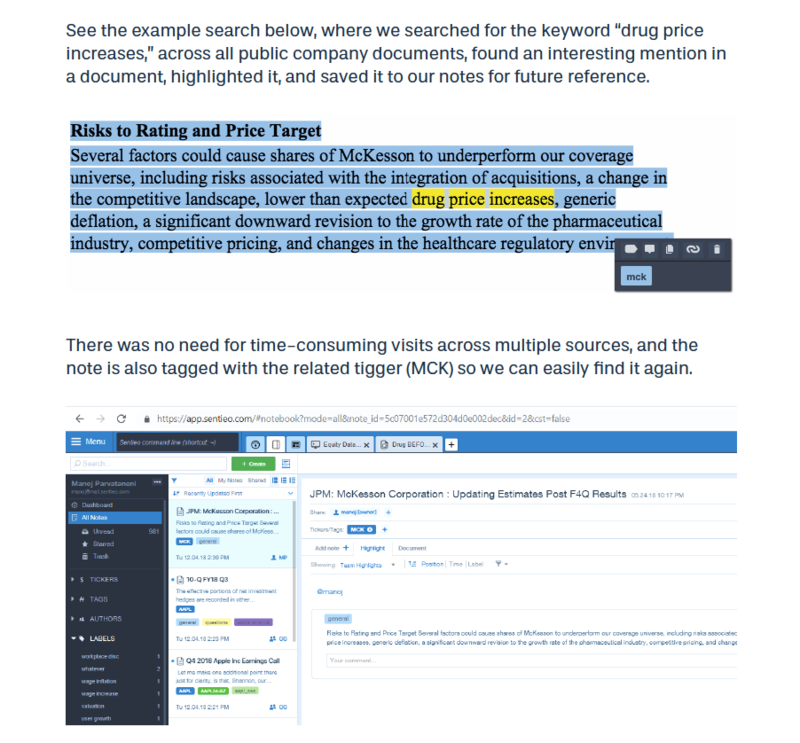 The street expects 30% top and bottom line growth for 2019 which we believe is highly conservative, especially since 60% of this growth is inorganic from the QuoteWizard acquisition. As the power of TREE’s diversified model begins showing through in 2019 we believe the multiple can expand substantially and the stock can move past previous highs. Finally, with 27% of TREE’s float short the stock, the stock’s move is likely to be amplified on any good news.